For Native American women photographers, identity is expressed in many ways. In Ghost Dance Remnant (fig. 1), Pamela Shields carefully constructs a collage that combines objects and images that recall specific aspects of her community's history. Her collages are complex visual stories that invite a complex reading. She uses Indian signifiers heaped one upon the other that take the viewer back into the past with her. Theresa Harlan (Director of the Carl Gorman Museum at the University of California, Davis) a Native American critic who has written perceptively and extensively about Native American women's art, calls Shields and other Native women artists "message carriers." They carry messages about Native cultures through their photography. Native women have always created objects (especially beadwork, ribbonwork, weaving, pottery, and basketry) that carried messages about their communities and cultures. What we would call the fiber and ceramic arts continue to be media in which many contemporary traditional Native women artists work. This work, both contemporary and historical, forms the basis of most Native art collections in museums and the vast market for Indian art. Artists working in less traditional media, including photography, who also use their art to carry messages about their communities, have received less recognition and far less patronage by art consumers. Since the 1970s, Native women have produced an astounding body of images in painting, printmaking, sculpture, and photography. They have confidently moved into the role of photographer, using film as a medium to carry messages to their own cultures. Photographer Hulleah Tsinhnahjinnie sees herself and others who use film as an integral part of Native communities. They are people, she says, who "help keep the community strong with their visions." As part of the modern art world, they have also carried messages about their art to non-Indian and pan-Indian communities. As Native women have added cameras to fiber and clay, they have explored ways to combine a search for personal and public identity. Their work has formed a critique, a different story, that explicitly and implicitly critiques the "vanishing race" genre of romantic photography so popular at the turn of the century and since the 1970s revival of Edward Curtis and other photographers of American Indians. These photographers portray their cultures not as vanishing, but as part of a lively, assertive group of people confident about the importance of their cultures in the past, their importance to the present, and their influence on the future. They sometimes use images identified with Indian cultures, but these images are not used as emblems of a generic unified past. Instead the images carry specific messages or stories about how individual artists interpret family and tribal histories, how they experience the present, or what they project for the future. As women, they may employ signifiers identified with female cultures and tell stories that relate to women's history, but their photographs may also have messages about gender relations, differences among Indian cultures, or commentary about Indian-Euro-American history. Sometimes there are no Indian signifiers at all except in written messages on the photographs or in captions. These photographers portray Native people with a wide range of physical and attitudinal characteristics. Some works are ironic or humorous, others angry, sophisticated, or reflective. The artists experiment with a wide range of photographic techniques. While sometimes women use straight photography and the silver print, at other times they use oil paint on photographs, hand-tint black and white photographs, photomontage, collage, or even use liquid light on muslin. In other words, they employ all the various techniques available to contemporary photographers. The women refuse to photograph some parts of their culture, especially religious objects and rituals, which most Native people feel inappropriate to represent visually. Many are hesitant to photograph people of cultures other than their own, feeling that Euro-Americans have been particularly insensitive and intrusive in their photography of indigenous cultures. Native women have been photographing their cultures for at least a hundred years. In the 1890s, Cherokee Jennie Ross Cobb (1881-1959) picked up her camera to photograph her classmates from the Cherokee Female Seminary in Tehlequah, Oklahoma. Cobb's Cherokee women defied the stereotypical photographic views of Native women of the time. They were poised, self-assured, fashionable, confident carriers of two cultures and extremely proud of their Cherokee heritage. Other women, also self-taught, took photographs during the next seventy years, a story still to be recovered. With the movement of Native women into art programs in the 1970s, their work quickly became known for its vitality and diversity. Native women portrayed their cultures assertively, proud of their past, sure of their relevance to contemporary art, conscious of the importance of their work for future generations of Native peoples. They stand at important crossroads, speaking to audiences in their own, pan-Indian, Anglo, and feminist art communities. Their photographs carry the history of Indian cultures, commentary on personal experiences, critiques of gender relationships, and expressions of solidarity with indigenous peoples. Pamela Shields (Blackfoot/Blood Band), who was born in 1956 in Salt Lake City, Utah and grew up in Calgary, Canada, currently lives and works in San Francisco, California. After receiving her BA in Fine Arts from San Francisco State University and a MA in Art from Ills College in Oakland, she began to turn to collage to explore visually her community's history. 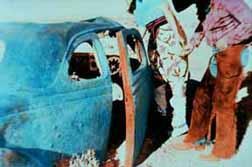 In Ghost Dance Remnant (fig. 1) she comments on the religious revival that was bringing renewal to many western tribes before the United States government suppressed it as a threat to its control in the late 1890s. 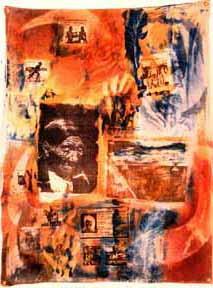 Peña Bonita (Apache/Seminole) uses oil paint on photographs to make commentaries about American culture and its relation to Native peoples. Bonita was born in 1948 at Ruidoso, in southwest New Mexico, and grew up in Cloudcroft, a small nearby mountain town where she says "if you didn't dance or sing or draw or something, you'd be considered the odd kid." She produces paintings, collages, and photographs, refusing to be restricted to one medium and says old patterns based on basketry or pottery designs keep her enthusiastic about art. She arrived in New York in 1973 with three children and, she says, about 35 cents and one phone number. She had danced in Las Vegas and she tried modeling, but was told she was too dark. Eventually she made her way to Hunter College where she majored in studio art and minored in art history. Instructors advised her not to put political content in her art, not to put religious connotations in it, and not to put in Indian symbols that could not be understood. Now she supports herself by working as a social worker and uses autobiography and political messages in her work. "My art very often doesn't stop with line, color, form, space, it has a definite political message. It has a definite history," she says. In Stalled (fig. 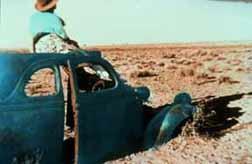 2), Bonita uses an image of a Native male looking under the hood of his aging automobile to see why it, and perhaps he, is stalled. Over the photograph she paints the words on a ten dollar bill, perhaps to comment on contemporary American culture and just how much he has gained from it. Carm Little Turtle (Apache, Tarahumara, Mexican), who was born in Santa Maria, California in 1952 and currently lives in Cubero, New Mexico, studied photography at the University of New Mexico. She has produced two documentary films as well as a large body of directorial and hand-tinted photography that is staged and uses props. Figures 3 and 4 are examples of her staged sequential pieces that show parts of bodies, but not faces, and use objects that have become metaphors for Indian lifestyles. Here she uses moccasins and a small basket. Many of her photographs tell stories about male-female relations, as does this series. In figure 3, a Native woman is shown with horses and cows on the horizon. Presumably, the animals lead her to think about taking a husband and settling down. 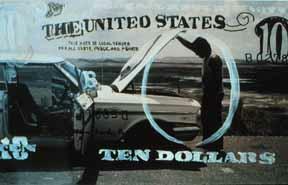 In figure 4, the shadow of a cowboy approaches. In a later scene the cowboy will offer her money. "She wished for a Husband, Two Horses and Many Cows"
Hulleah Tsinhnahjinnie (Navajo, Creek, Seminole), who was born in Phoenix in 1954, has created a large body of work since she completed her BFA at California College of Arts and Crafts in Oakland in 1981. She uses photography as a language to translate images in her head into highly complex studies about the loss of identity, interculturalism, loss of contact with heritage, and the spiritual power of indigenous women. For Hulleah, photographs are lessons and photography is a way to keep Native communities "strong with their visions." In Mattie Looks for Steve Biko (fig. 5), a photocollage created in 1990 for the Oakland Art Museum's exhibit "Talking Drum, Connected Vision: Native American Artists Addressing Affinities with Indigenous People of South Africa," Hulleah poses her young friend Mattie dressed in a wing dress and moccasins. 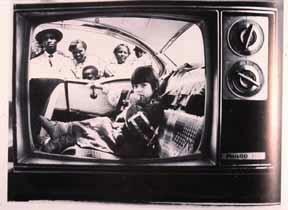 Mattie is seated in a car placed within a television frame. A black family is looking in. They are, Hulleah's title informs us, looking for Steve Biko, the black African who was killed by police for his efforts to end apartheid. With the writings of critics such as Theresa Harlan, as well as of the photographers themselves, a body of criticism and analysis is beginning to translate the messages these Native women artists bring. Harlan reminds us that the layers of native culture and historical content in these photographs may be so complex that only members of a tribe or village can read the symbolism and that native and non-native alike may need supplementary information to read the messages. The challenge for the non-native viewer is to become informed, first by acknowledging not-knowing, and then by seeking to understand, not just the photographic images, but the stories they convey about cultures. These photographs are teaching a way of remembering that will allow Native women to retain possession and ownership of the ideological space that they occupy. In "To Watch, To Remember, and to Survive," Harlan writes: "It is only when we as Native peoples take control of how we are understood that we will have a sovereign place and time for Native intelligence, Native knowledge, Native history and Native culture." Knowing the work of contemporary Native women artists is a way to remember the importance of Native cultures historically. All text © Joan M. Jensen.